Turkeys, dressing, and family gatherings are an accepted fact of the fourth Thursday of November, but do you know why Thanksgiving is celebrated? The holiday dates back to 1621 and is rich in tradition and meaning. 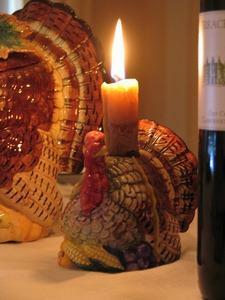 Thanksgiving dates back to the time of the Pilgrims and Native Americans. From simple times of celebrating a bountiful harvest to becoming a national holiday, Thanksgiving's history is filled with inspiration as well as tradition. Although historical accounts have pointed to feasts of thanksgiving as early as 1565 in the New World, the celebration that has traditionally been deemed "The First Thanksgiving" occurred in 1621. In 1620, the Mayflower landed in Plymouth, Massachusetts. It held colonists, later known as Pilgrims, who had left England in search of greater religious freedom. Unfortunately, the Pilgrims arrived in December, and many of the new colonists did not survive the harsh winter. With the help of local Native Americans, they were able to plant crops in the spring of 1621, and thus enjoyed a bountiful harvest. With the crops assuring a better winter, the Pilgrims planned a feast of thanksgiving. It is this image of colonists and members of the Wampanoag tribe enjoying a meal together and giving thanks for the fruits of the land that has served as inspiration for the holiday to this day. These harvest observances continued after the first Thanksgiving, mainly in New England, and never resulting in a coherent national celebration. However, in the mid-1800s, Sarah Josepha Hale, a magazine editor, began to champion its cause. Her editorials and letters finally found a sympathetic ear in President Abraham Lincoln. The Pilgrim Hall Museum details that the 1863 Thanksgiving Proclamation made the last Thursday of November a national holiday and day of giving thanks. It was Franklin Delano Roosevelt, hoping to extend the Christmas shopping season in a country emerging from the Great Depression, who decided to move the holiday to the fourth Thursday in November instead of the last Thursday. His 1941 law further cemented Thanksgiving as a national holiday. As a celebration steeped in American history, you might expect it to be a day of remembering the country's forebears and displaying patriotism. However, in modern times, consideration of the first Thanksgiving is generally relegated to school-aged children. Although that first celebration was a landmark moment in the history of America, beyond giving thanks for freedom and safety, you won't typically find the flag waving of the Fourth of July or Memorial Day. Instead, the holiday remains centered on family, friends, and food. Some see the holiday as a last bastion of non-commercialization. Beyond a few centerpieces and themed party supplies, Thanksgiving doesn't receive the same marketing push as Valentine's Day, Halloween, or especially Christmas. It feels more pure in this regard. However, the time and money required to create a traditional Thanksgiving spread doesn't make the day completely free of pressure. Although giving thanks for the many blessings of life is easily interpreted as a religious sentiment, there is no particular creed or belief system associated with the holiday. A community might host an ecumenical service in honor of the holiday. Families often say a prayer over the food before beginning dinner. Churches sponsor holiday dinners as outreach to the poor and lonely. However, all of these actions are founded on the basic, secular premise of giving thanks. From preschoolers making handprint turkeys to adults remembering the most important people and moments in their lives, it is easy to answer why Thanksgiving is celebrated. Like the Pilgrims did on that long-ago day, people all gather to give thanks for the many bounties life offers on this special day.